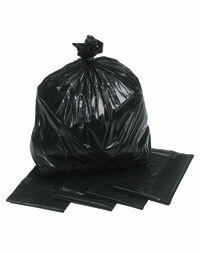 Clear plastic sacks with a wide variety of applications (visual identification of waste, dust extractor sacks etc). PLEASE NOTE: We are now offering these versatile and strong clear polythene sacks in packs of just 5 sacks. Look down the Pack Qty column below to see the new small quantity packs. Product description: Clear plastic sacks with a wide variety of applications (visual identification of waste, dust extractor sacks etc). Description: "Photo of a clear polythene sack"
Large Clear Polythene Sacks. Clear plastic sacks with a wide variety of applications (visual identification of waste, dust extractor sacks etc). Now available in packs of just 5 sacks.